The item Mycroft holmes and the apocalypse handbook, Issue 5, Kareem Abdul-jabbar and Raymond Obstfeld, (electronic resource) represents a specific, individual, material embodiment of a distinct intellectual or artistic creation found in Richland Library. 1874. 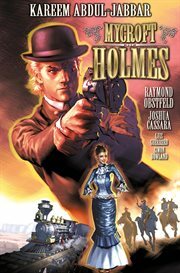 Despite the best efforts of a cadre of international thieves, criminals, and assassins, Mycroft Holmes and Adler have finally found the Apocalypse Handbook - a collection of working blueprints for deadly, highly advanced weapons. But their young ward, Kerry, has been abducted. Now, they await delivery of the ransom demands. The fates of both Kerry, and of the free world, rest in their hands!